Track Down Those Memory Bugs! Problems with memory cells in your computer's RAM (where you do your programming) can sometimes be quite subtle. It would be clear that you had a bad cell somewhere if your computer responded to your question, ? FRE(1) by saying that you had 320 bytes free before you'd even put a program in. But what about the less obvious memory problems? A cell might only go strange when the cell next to it contains a five. Or it might work fine, but fail after a certain amount of time passes. Such subtle failures, fortunately relatively rare, can have you looking in vain for a bug in your program. Mr. Scanlon presents a sophisticated memory testing program here (in machine language, for any computer which uses the 6502 chip, Apple, CBM/PET, Atari, OSI, VIC). This program can uncover some of those more subtle cell failures. If you just went out and bought a new tape recorder, a pair of jeans, or a quart of milk, you'd find out in short order just how good or bad the product is. If the tape recorder makes a Sousa march sound like a funeral dirge, back to the store it goes. Likewise, the jeans will show their quality after the first washing, and your nose knows if the milk is bad! Unfortunately, faults in a computer memory board may not be that evident. Certainly, you will spot obvious defects – a crack in the board, missing chips, and the like – but if the board is operating at all, you'll probably need a diagnostic program to pinpoint any specific problem. This article presents one such program. It was developed on a Rockwell AIM 65 microcomputer, but it can run on any 6502-based computer, provided you alter the output routines. The general principles can, of course, be applied to other types as well. Besides "dead" chips, which cannot store any data, memory boards have a variety of other potential problems. For example, some chips contain one or more bits that will not accept information, or bits that just hold the information briefly, then lose it. Other chips will not accept certain bit patterns, or affect other memory chips in the array. We can't hope to write a single program that will identify all possible errors, but the program given here will isolate most errors – or at least give you enough information to delve deeper into the problem. The diagnostic program in this article uses an algorithm that was implemented for 68000-based systems by Robert D. Grappel ("M68000 Diagnostic Program Tests Memory," EDN, April 15, 1981, pp. 157-158). This algorithm has two main loops. The first loop fills the tested portion of memory with increasing bit patterns; 000000002 is written into the first byte, 000000012 is written into the second byte, and so on. With this done, the second loop checks the memory contents and prints an error message each time a mismatch is detected. The test then repeats, each time incrementing the contents of each byte. Thus, after 256 cycles, each byte has held all possible values. Note that the test is destructive; any pre-test information in the affected RAM will be eradicated. The program described here also allows you to check for either hard failures or soft failures. Hard failures are those that cause the loss of ability to change the state of one or more bits, whereas soft failures allow a change, but revert back to the original state after a period of time. For soft failure testing, the time delay between write and read/verify has been set at one minute, arbitrarily. With the two tasks now defined, we can look at a program that will do the job. Before doing so, however, it will be helpful to investigate the overall structure of the two loops, by looking at their flowcharts. Figure 1 shows the sequence of operations for the write loop, the loop that fills the test portion of memory with increasing bit patterns. This loop is preceded by some necessary initialization. First, the cycle count is set to 255. We actually want 256 cycles, but with a microprocessor that has only eight-bit registers (and memory locations), it is convenient to use 255, and plan ending the test when the cycle count has decremented past zero, to an all-ones (hex FF) state. Next, the start pattern – the pattern that will be written into the first test location – is initialized to zero. Admittedly, zero is arbitrary. Since we will cycle through memory 256 times, each location will eventually receive every possible bit pattern. Therefore, it really doesn't matter which value goes into the first byte. At this point, the microprocessor enters the actual write loop. It starts by writing a pattern into memory, decrementing the byte count, then checking whether test memory has been entirely filled with test patterns (byte count = 0). When the byte count is zero, the microprocessor branches to the read/ verify loop, at either its soft error test or hard error test entry point; path A or path B, respectively. Otherwise, pattern and index are incremented, in preparation for writing to the next byte. When the index has been incremented past hex FF, and reaches zero, a new base address is calculated, by adding 256 to the existing base address. Again, this is necessary because our index registers are only eight bits wide. A nonzero index causes the microprocessor to loop back to write the next pattern into memory. This concludes our discussion of the write loop. As expected, the sequence of the read/verify loop (Figure 2) is very similar to that of the write loop. However, the read/verify loop has two separate entry points, one for soft error testing (in which the loop is preceded by a one-minute time delay), and the other for hard error testing. The read/ verify loop begins with a call to the SETUP subroutine, to fetch the starting test pattern and reinitialize the base address and index. With this initialization completed, the byte-by-byte comparisons begin. This consists of comparing the contents of each memory location against the test pattern that was written into it. If a mismatch is detected, the microprocessor calls an error subroutine, to print out the pertinent information – bad address, expected pattern and the pattern read. The rest of the read/verify loop is identical to the bottom of the write loop, except that when all locations have been read, the read/verify loop increments the start pattern and checks for end-of-test (cycle count less than zero). If further testing is necessary, the microprocessor branches back to the beginning of the write loop. Store the starting address in locations 00 and 01, with the low byte in 00. Store the ending address in locations 02 and 03, with the low byte in 02. Select soft error testing or hard error testing by storing a value of 00 or 01, respectively, in location 04. Besides these five locations, the program uses 11 other zero page locations, as working storage. These include three parameters that have already been discussed–byte count (BCOUNT), starting address (STARTP) and base address (BADDR)–and four additional parameters which have yet to be discussed. Of these four, the working byte count (WCOUNT) is a byte count that gets decremented during each cycle. In fact, WCOUNT gets decremented twice during each cycle–once during a cycle through the write loop, then (after being reloaded with the byte count, BCOUNT) once again during the subsequent cycle through the read/verify loop. The parameter SPAT is a save location for the test pattern. During the read/verify and write loops, the test pattern is held into the accumulator; SPAT saves the pattern while the accumulator is being used for other operations. The last two parameters, PADDR and ROTLOC, are used to hold information that gets printed out if an error occurs. Specifically, PADDR holds the effective address of the error location and ROTLOC holds the "should be" pattern and the "is" pattern (i.e., the expected pattern and the actual pattern). Next come equates that reference three subroutines in the AIM 65 monitor: NUMA prints the contents of the accumulator, as two ASCII characters; OUTPRI sends one character to the print buffer; CRLOW initializes the display and printer to their "start" positions. 01-0080 2000            ;THE PROGRAM RETURNS TO THE MONITOR WHEN DONE. 01-0290 0010            NUMA =$EA46                 ; PRINT A, AS TWO ASCII CHARS. 01-0620 022D D0 0A      BNE INCP                       ; BYTE COUNT = 0? 01-0720 023F D0 DB              BNE WRITE       ; INDEX = 0? The rest of Program 1 shows the source code for the initialization sequence and the write loop. The programming is straightforward, so you should have no problem following it if you studied the flowchart in Figure 1. Note that the write loop is terminated when the byte count has been decremented to zero. At that time, we interrogate the contents of the user-specified parameter HARD (location $04), and branch to the read/verify sequence, at either READS (if HARD contains zero) or READH (if HARD contains a nonzero value). 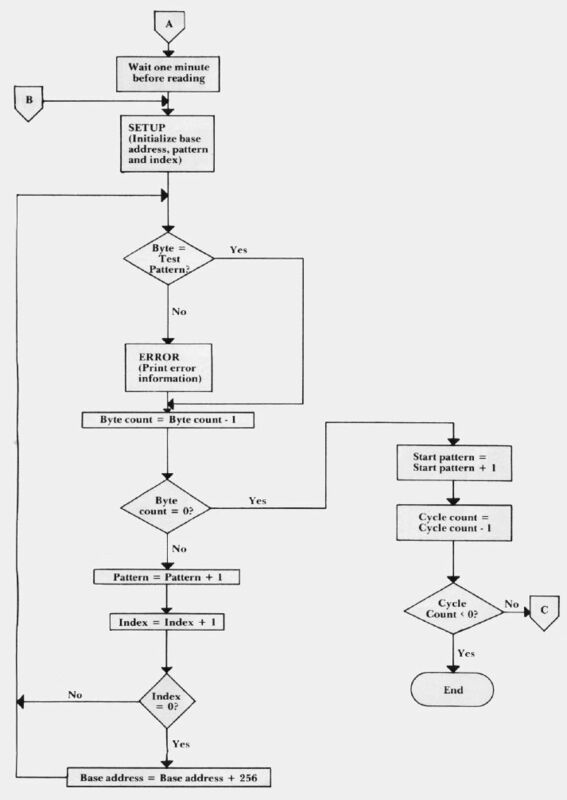 The read/verify sequence, shown in Program 2, also follows its earlier flowchart (Figure 2), and needs no additional description. However, you may be interested in the one-minute time delay routine that gets executed if you are testing for soft errors. This routine, DELAY 1, generates the one-minute delay by executing a 300-millisecond delay routine (D300) 200 times! Readers who are interested in the details of this and other delay routines are referred to my book 6502 Software Design (Howard W. Sams & Co., 1980). Because the D300 uses the X Register – which holds our program's cycle count – the contents of that register must be saved on the stack while the time delay is being generated. 01-0960 025D DD1 0A     COMP    CMP (BADDR), Y  ; BYTE = TEST PATTERN? 01-1070 0273 D0 04              BNE INCP1       ; BYTE COUNT = 0? 01-1130 027E DO DD              BNE COMP        ; INDEX = 0? 01-1180 0287 E0 FF              CPX #$FF        ; COUNT CYCLE NEGATIVE? The final program, Program 3, shows the source code for the set-up subroutine (SETUP), followed by the error printout subroutine (ERROR). As was mentioned previously, if the read/verify sequence reads a pattern that does not match the expected pattern, the error subroutine prints out three items of information: the address of the offending location, the expected pattern (the "S/B" pattern) and the pattern that is actually read (the "IS" pattern). As an aid to identifying faulty bits within a memory location, the S/B and IS patterns are printed in a binary representation. To do this, ERROR calls a second subroutine (BINARY) that left-rotates the contents of a working zero-page location, ROTLOC, eight times. After each rotate operation, BINARY outputs an ASCII 1 or ASCII 0 to the printer. Figure 3 shows the kind of listing that the ERROR subroutine produces. To generate this listing on my AIM 65, I selected three locations within the monitor ROM – LOCATIONS $E000, $E001, and $E002 – knowing that a read/verify test on ROM will always fail. As you can see, the printout has been retyped for publication, because the AIM 65 printer output does not reproduce very well. 01-1930 02FA    26 0F           ROTATE  ROL ROTLOC       ;IS BIT A 1 OR A 0? 01-1950 02FE    A9 31                   LDA #'1'         ; IT'S A 1? Having seen the source code listings, you now know that the test program occupies slightly more than a page of memory; to be exact, it occupies 290 bytes. However, you're probably more curious about how long the program takes to execute – which translates to how long you will have to stand around before you know whether or not the memory is "bug-free." In testing for hard errors, the program takes about 25 seconds to test 1024 (or 1 K) bytes, if your computer has a 1-MHz clock. This means that it will take six minutes and 45 seconds to test a 16K-byte board. In testing for soft errors, the program introduces a one-minute time delay between each write and read/verify sequence. And since the program executes 256 cycles, soft error testing will always take two hours and 16 minutes more than hard error testing, regardless of how much memory is being tested! Therefore, it will take roughly two hours, 22 minutes and 45 seconds to test a 16K board for soft errors. Clearly, it's best to check for hard errors first, then re-check for soft errors if you're still having problems.